Vertical power docks offer a great solution for spaces that only require intermittent use of power and data connectivity, allowing the user to simply unplug the devices and push the power dock down to close it and thereby leaving the workspace free and clear. 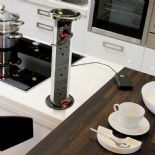 Ideal for kitchens and workspaces that are designed for multiple uses. 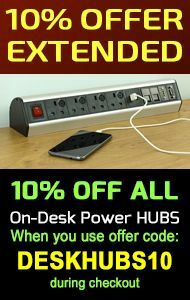 Office power products offer a range of standard and premium vertical power docks offering power, data and usb connectivity.